As you can no doubt tell from the graphic, my friend Kim took me up on my offer to critique my books. And she’s pulling no punches. 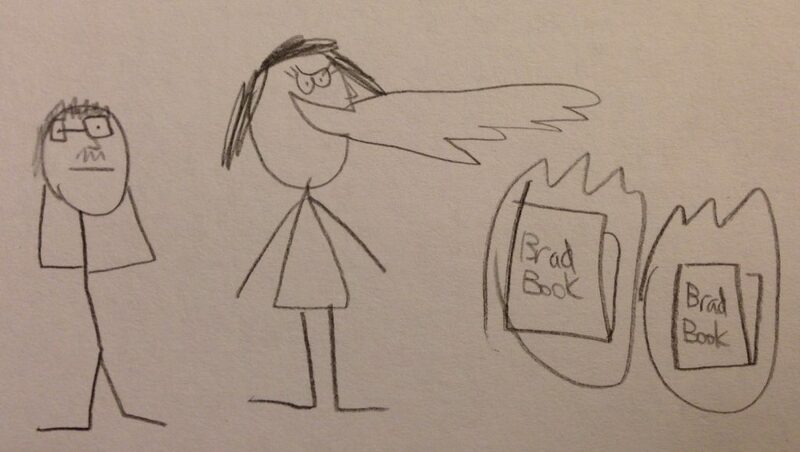 Her daughter drew this picture to embody the furious judgment her mother is administering to my unworthy tomes. I wish you could see it. There are words stricken through, punctuation highlighted with fierce disapproval, and comments in the margin as far as the eye can see. These comments shed some light into her critiques, so I’ll put the best ones below along with my responses. Will Kim’s critiques be acknowledged? Or will they fall on deaf ears? The roasting begins! First line of the book. FIRST line. “May I have your attention, please?” the man asked from atop his stage. Now, Mean shouts out his title and name in the very next paragraph. But why don’t I just say the name here? See, it mostly has to do with the retention of facts. Mostly names and dates. If you tell me a name without anything else I’m going to forget it. So I always want to make the reader hungry for facts before I drop them. Get them thinking “Who is this man?” “Why is he dying?” Then BAM! Here comes his name! Sorry, Kim. Critique denied. “Whiskers!” shouted someone from in the crowd‘s middle. Now does anyone really care where this person is in the crowd? I know I don’t. Critique granted! Overuse? Ha! You must be new here. Besides, that’s only the second exclamation point. Tecker is on a stage! Full of passion! The doors are almost always marked by six pillars, and many have interactive panels––it shouldn’t be too much trouble to work them. Tecker is talking about hex doors, here. They teleport people to another hex door, and all of them in every book ARE marked with six pillars. However, some don’t have panels since they’re activated by thought alone. The first half of your request: granted!!! “And not just the land; the technology you find as well. It may be called ‘magic,’ but it works on many of the same principles that our machines do; they require programming, engines for power. I know; isn’t it wonderful! This probably does need explanation, since the crowd would likely be wondering too. It also gives me another chance to add more semicolons to Tecker’s speech. I’m going to skip ahead in the notes because all the qualms that Kim has with Darrow are part of his character: he is forgetful and inconsistent. That is why he instantly forgets Tecker’s name and doesn’t seem to know what a juice dispenser is. Yes, I forgot to mention that he’s awkward too! You’re a peach, Kim. And with that he departed, wiggling his fingers at the two girls as his flower-printed shirt melted into the crowd. HA,ha stop! Kim, you’re too much! Hoo! Okay. I don’t know how this seems perverted but if you’re REALLY bothered by it I’ll have him raise his mug in a farewell toast or something. I mean, I can’t have him out-creeping Parlay. The end of the prologue has Kim worrying about the scant number of people at the table since I said there was a ‘mob’ earlier. I’m going to change this part to include Kates anyway, so I’ll make it more clear that time has passed for the ‘mob’ to disperse a bit. Because the break in the page and the line of FIVE DASHES wasn’t enough. Kim is also begging me to name every character as opposed to descriptions like “mitt-wearing girl.” What did I tell you? You gotta make the reader thirsty for those facts! In this case it IS a problem though, since there was confusion when Trisk showed up later; Kim thought she was the previously mentioned mitt-wearer. I can’t argue with that. YOUR WISH HAS BEEN GRANTED. This entry was posted in Critique by Brad Smith. Bookmark the permalink.